How often do you use a shower backwards? that is standing with your back to the shower head? Sure, you might stand that way part of the time that you shower, but at some point, you had to have been facing the shower to turn it on, right? And when you use a shower (or a faucet for that matter) it generally follows the pattern of HOT is on the left, while COLD is on the right, correct? You sort of come to expect that. Well not in our city. Things are a little backwards here. 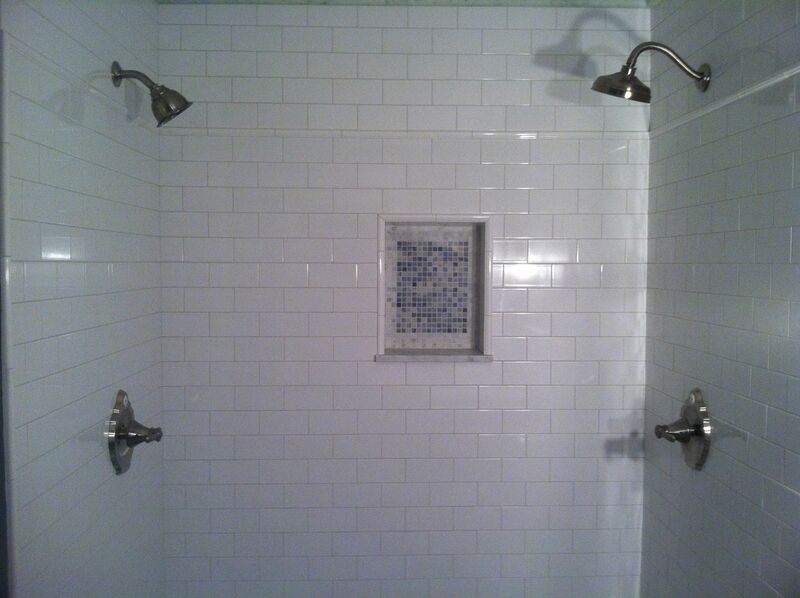 Our first floor shower with opposite shower heads. Our first floor bath features TWO shower heads with TWO separate valves which face each other on opposite walls. In our final plumbing inspection today, the city inspector only gave us a conditional approval because one of our shower valves was not mirroring the other. The inspector made the case that even if they are on opposite walls, if you turn the shower handle to the left to get HOT on one side, you must also be able to turn to the left to get HOT on the opposite side (not right as one might plumb it because they were just following, oh I don’t know, COMMON SENSE! not to mention the instructions from the manufacturer). Now depending on what side we shower on, we have to turn the handle in different directions to get HOT. The exposed valve, prior to being put in UPSIDE DOWN per the city. 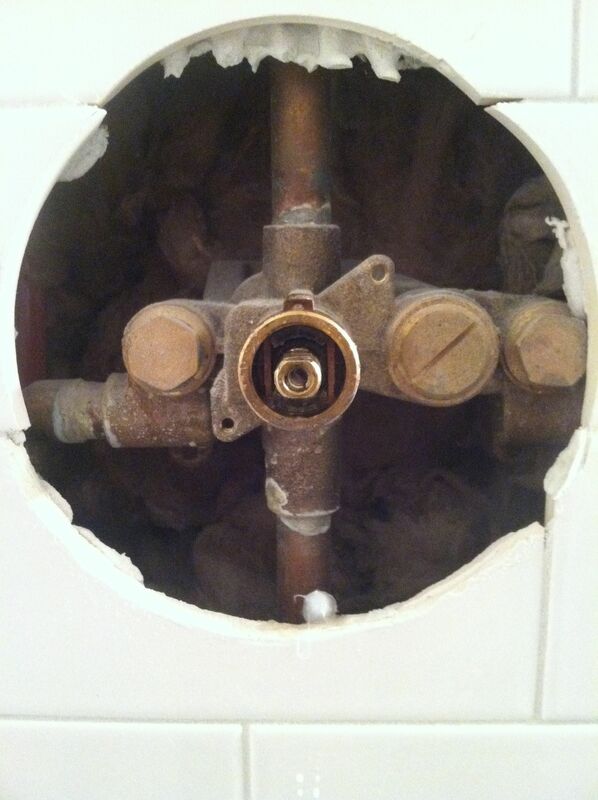 I’ve moved the valve per their request – it’s actually quite simple and just requires a few tools. It necessitates taking the handle and trim off on the valve facing, removing a pin that holds the cartridge in place, then pulling out the cartridge and turning in upside down. Again, it’s very easy. But it’s more the principle. From our many years involved with this remodel project, we’ve paid the city thousands in permit fees and done all our required inspections. 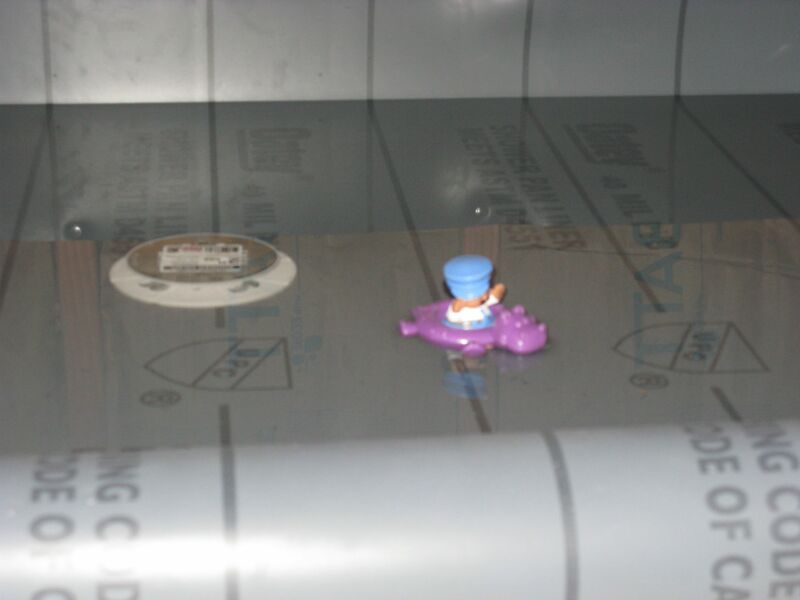 But the inspectors have never found anything that is truly a safety issue or any real fault in our construction – instead, it’s things like the shower valve, or on our plumbing rough in, it’s the screws used to hold the toilet flange to the floor (the inspector thought the brass screws would rust out. Whatever). Is it just that they have to find something to help them feel better, or assert their authority? And how can one inspector truly be proficient enough to inspect everything on a remodel, from plumbing to electrical, and structure to HVAC and know the precise detail for each? A bit of time as has past , 227 days to be exact, since we last posted and although work has slowed as life has picked up, we are still making progress. All it takes is money and time, time and money 🙂 And perhaps the fact that we actually have some sort of time restrictions on our permit that urged us on to get a bit more accomplished. With our permit expiring at the end of the month, we decided it was time to finish up the plumbing. By having an inspection it extends the permit expiration date. Last year we found a great deal on a clawfoot tub for our upstairs kids bath, and we even managed to get it upstairs too with no injuries! (It’s amazing all the uses for cardboard there are – like protecting 118 year old stairs from a tub being pushed up them). Those cast iron tubs are heavy, but it’s been sitting upstairs along with all our plumbing parts for a few months now just waiting for the next step in finishing the bathroom – painting the tub. Although the tub was new, it was a great deal, so that meant the outside of the tub wasn’t the most beautiful thing. 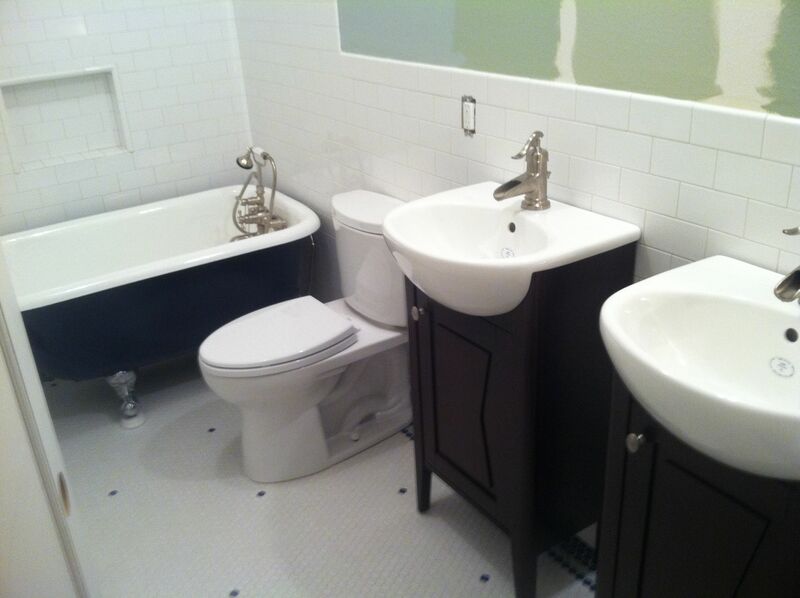 It was a factory second, or perhaps just had a rough life in the showroom, but at any rate we really wanted it to complement our color title choices we used in the upstairs bath. Because of that, we decided to paint the outside of the tub. 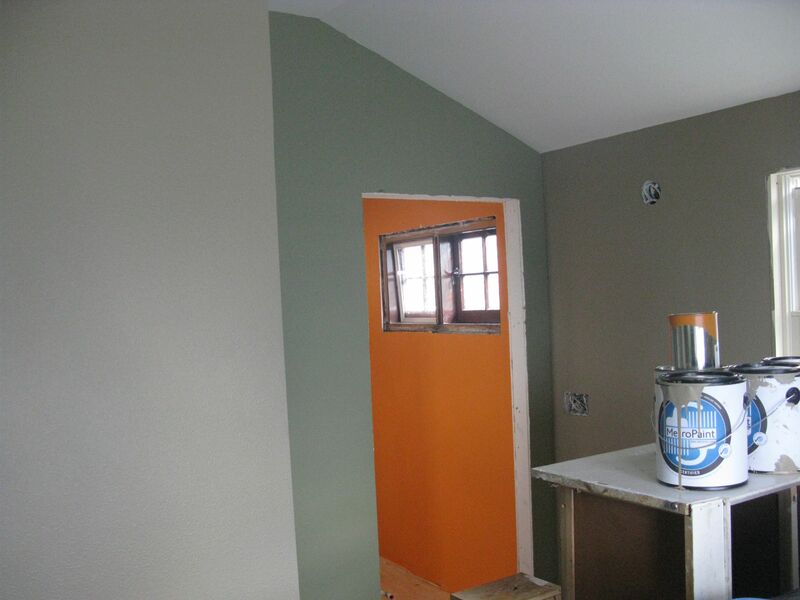 We’ve seen some painted tubs, and never done one before, so like most everything else in our remodeling project it would be an opportunity for learning. 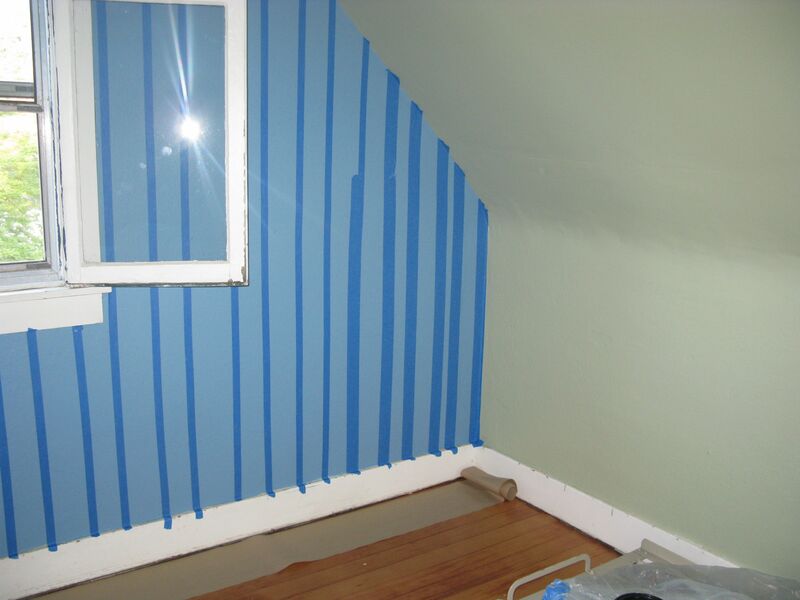 We chose a color that complemented our title – a nice shade of blue, which we would administer by spray can. 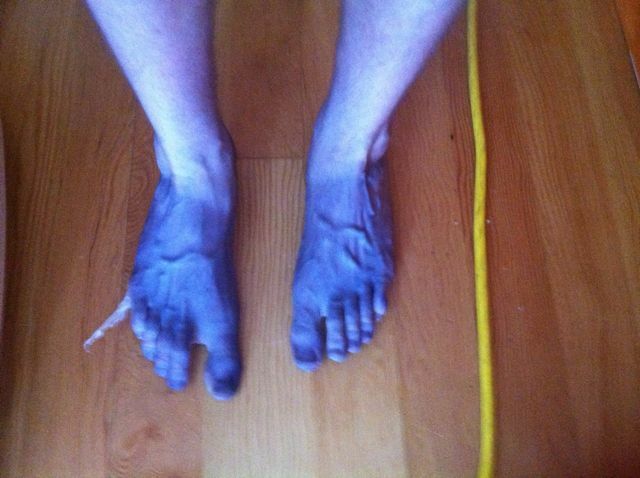 I “blue my feet” with the spray paint on accident. Next time, I’ll wear pants and socks at least! Being that the tub was several hundred pounds, it wasn’t going to be moved out of the bathroom for painting. 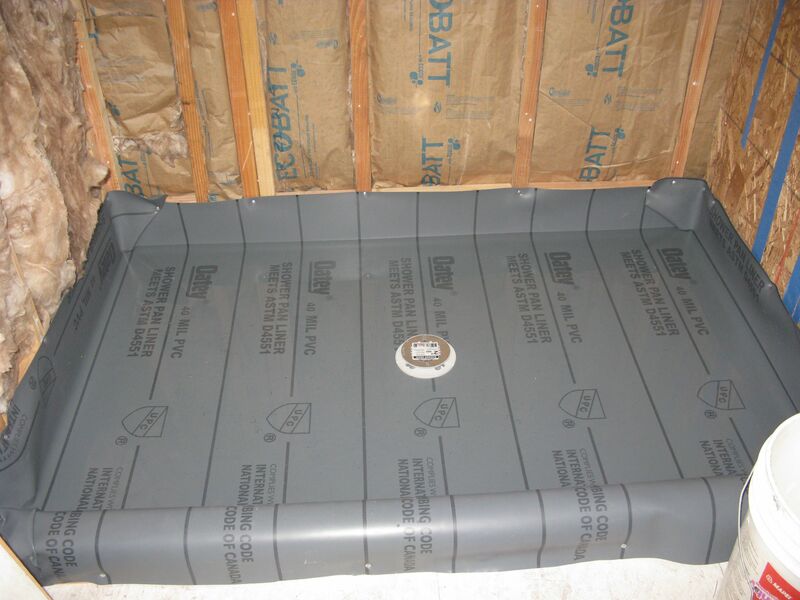 So the best we could do was mask off the bathroom with sheets of plastic to cover the tile on the walls and floor. 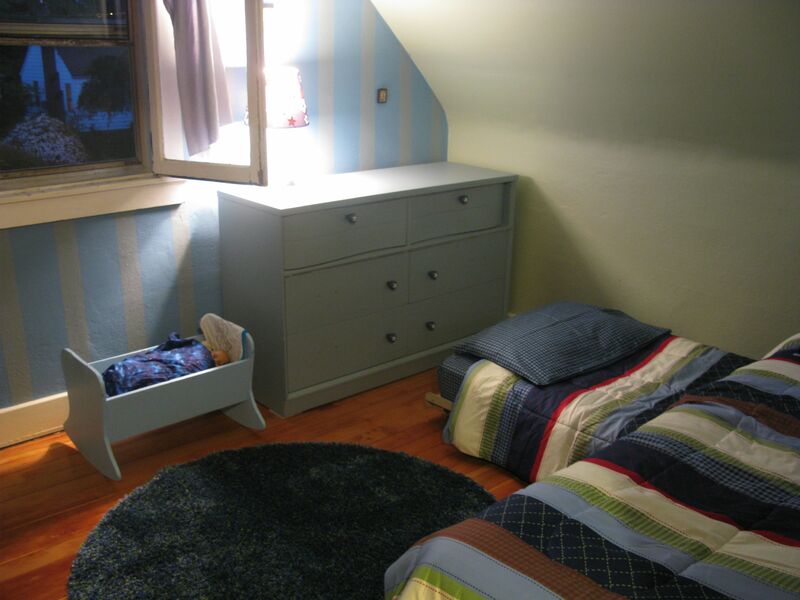 (Being that we haven’t installed any fixtures or painted the room yet, this was rather easy). Next step was a light sanding of the tub, followed by a cleaning. There was a pesky bit of packing tape on the tub which with some persuasion came off. Applying our lovely shade of blue was the last step. Because of the warm weather we’ve been having and also the high humidity, we had small window of time in the morning to paint. 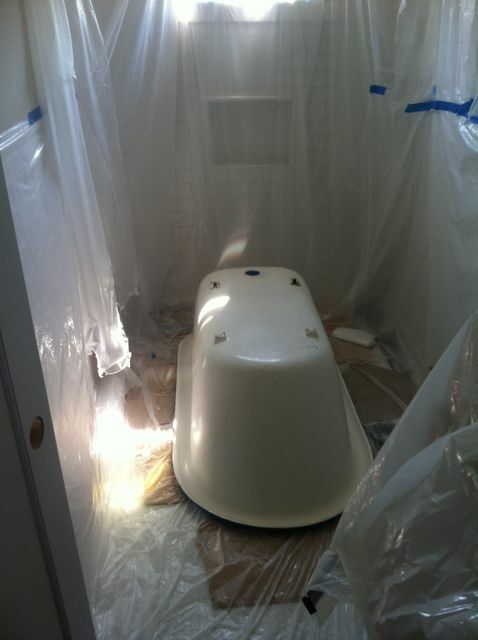 The spray went on the tub very easily with no drips – just like the commercials. 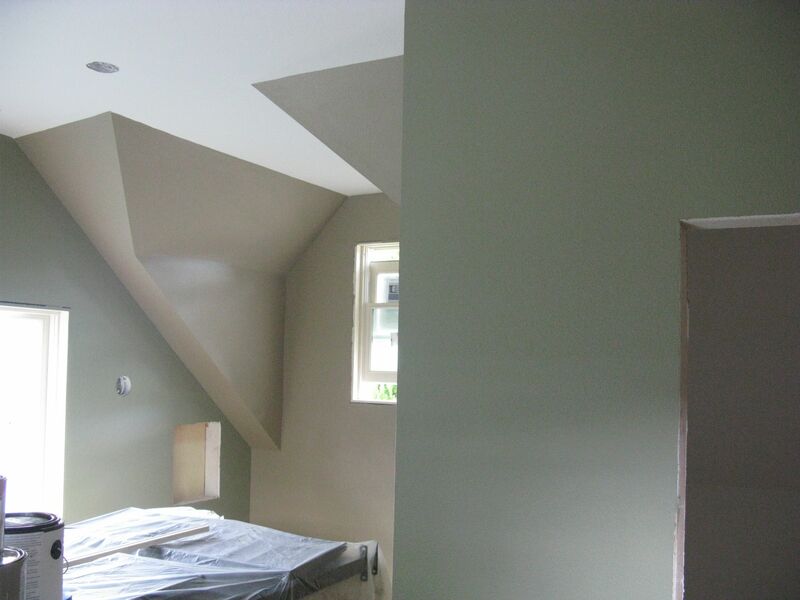 One coat, followed up by a second coat a little bit later. The one part that wasn’t like the commercials is when a but of the plastic covering the floor got moved during the spray application and a mist of the blue paint drifted over and colored the floor. It’s roughly in the outline of the box for the toilet which was sitting there. 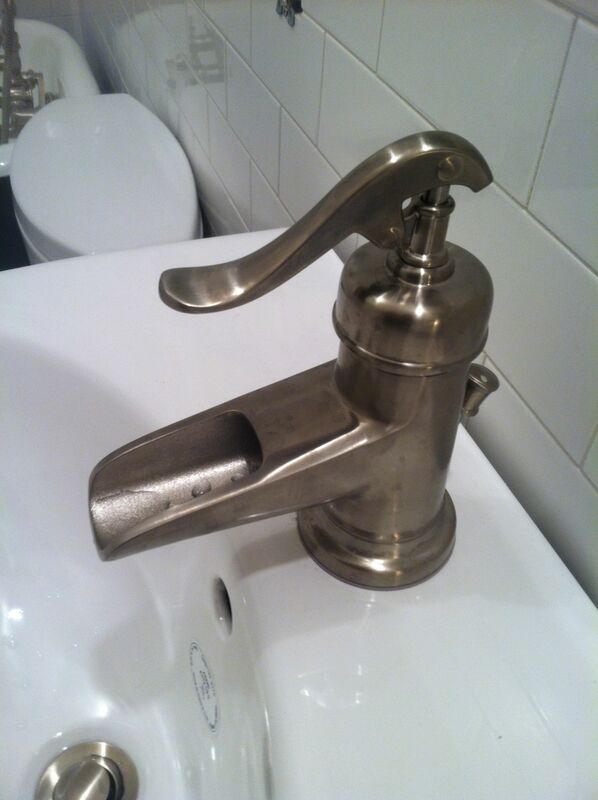 We liked these faucets because they look like a water pump! 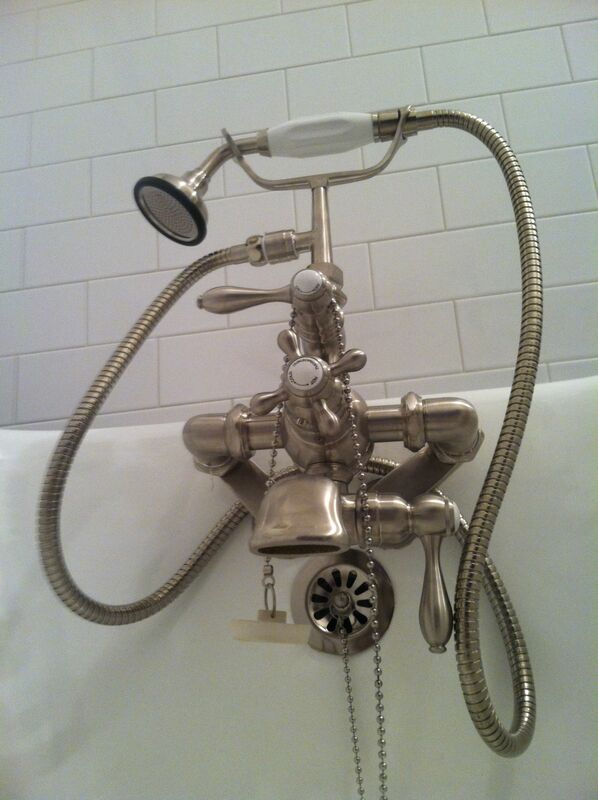 Our tub spout and hand shower – it almost takes a manual to use! 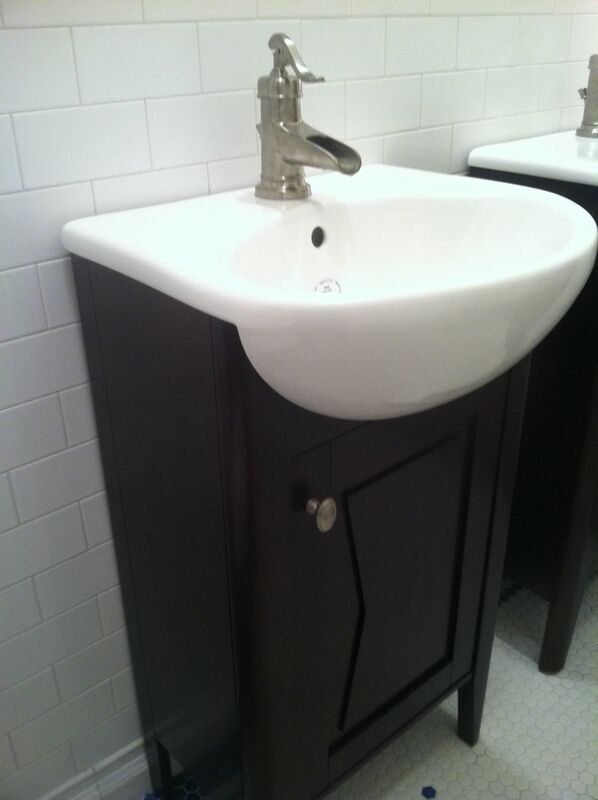 The vanities – small size for a small room. The weather has turned for the cold and ugly, and while it’s been awhile since we’ve done some posts, we’re still hard at work. Okay, perhaps only moderately hard at work, since with the daylight savings and plethora of rain, there IS a limit to what the human body (and Goretex) can withstand. And while we are still working to add the finishing touches to our addition, let’s get you up to speed on the past few months of goings on. We had thought a nice “addition” to our addition would be a patio off our back porch. Something with stone, some nice furniture perhaps and a fire pit – it would be awesome on a cool Fall or Spring night. And while we dreamed it, it was just never a priority due to the materials, cost, time and well, all the other things we had to do. The future home of the patio was an area directly behind the addition, and one in which we had done some hard labor to move our rhododendron twice. 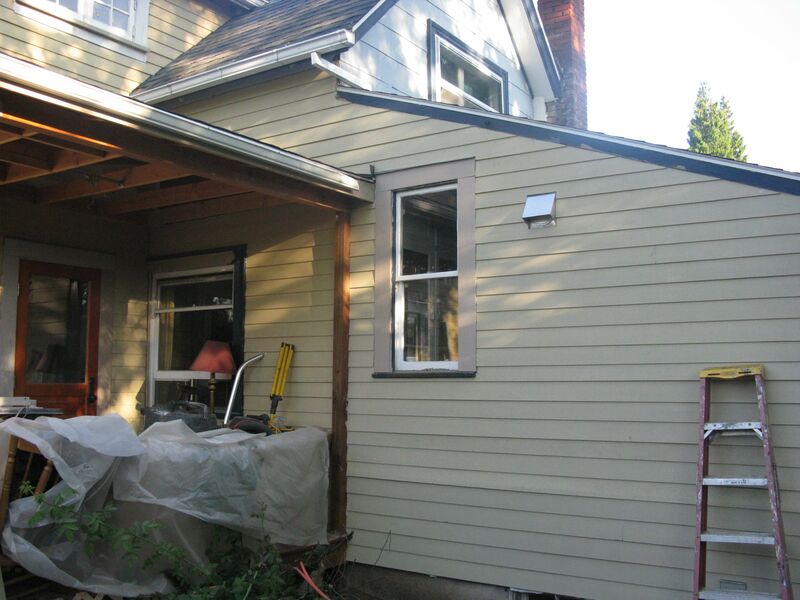 Before the addition went it, it was considered the side of our house and was a nice grassy patch. Now, it sloped the wrong way from the house, and since it never got much attention after the digging was done, it was just a patch of grass and dirt. Things changed some when we were able to freely acquire some slate for the patio. While we still didn’t have the time for the patio, we at least had some materials. summer happened, and we made quite a bit of progress on a few other things, but not on the patio idea. What really got the ball moving was that summer was ending and we realized there was a bunch of stuff to accomplish still outside. The patio, it turns out, was important because as part of our permit, we needed to have inspection on landscaping and erosion. I took advantage of a job transition, and put in some long, backbreaking hours digging dirt to grade the patio. (We had a very dry summer, so it wasn’t as much digging of dirt as it was chiseling of it). I dug down six inches next to the house, then graded it down from there and a gradual slope towards the middle of the yard. 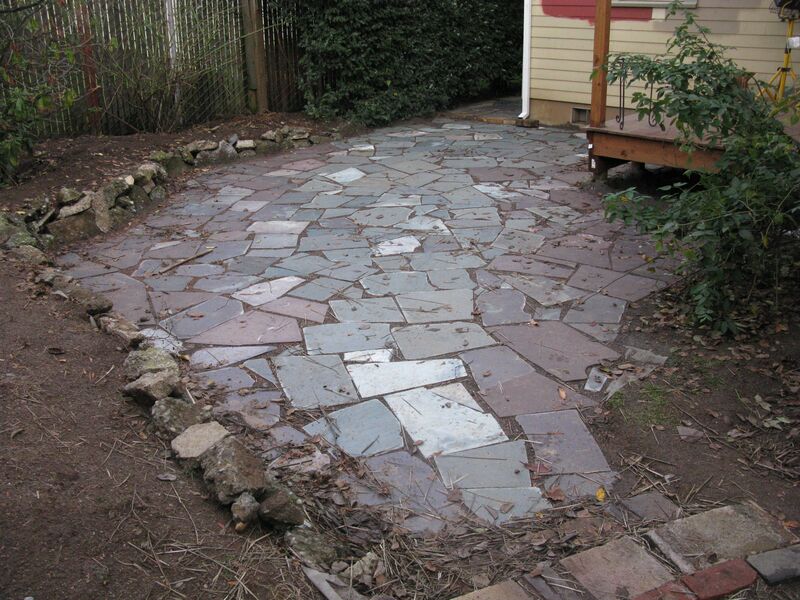 The resulting dirt and sod was piled up on the grass at the end of the patio, with the plan that some of it would graded into the lawn and the rest kept as a large planting bed for the patio, held in place by a short retaining wall. With the dirt moved and the ground graded, I laid out weed barrier to serve as the base layer of the patio and stop roots and weeds from growing up through the patio. I had called around for the best prices on 1/4 minus gravel and sand, and arranged for it to be delivered. 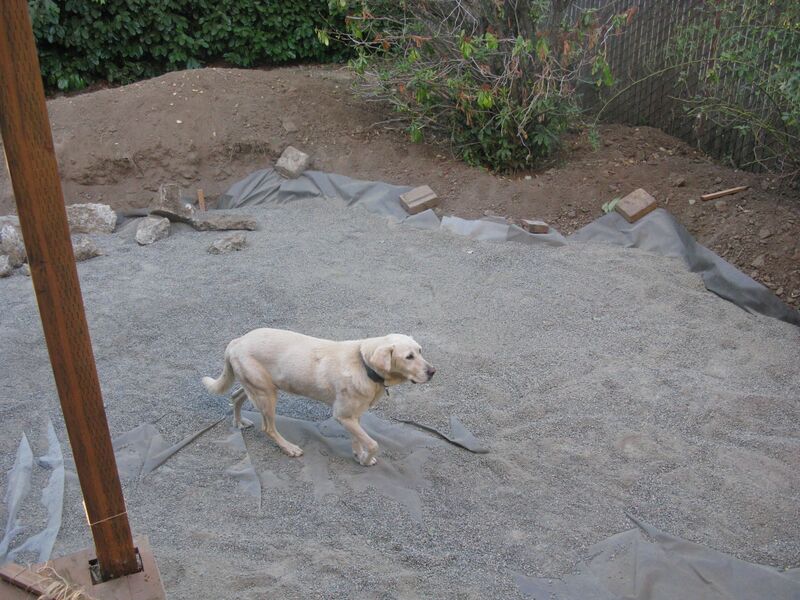 The dog patrols the weed barrier, prior to the gravel. 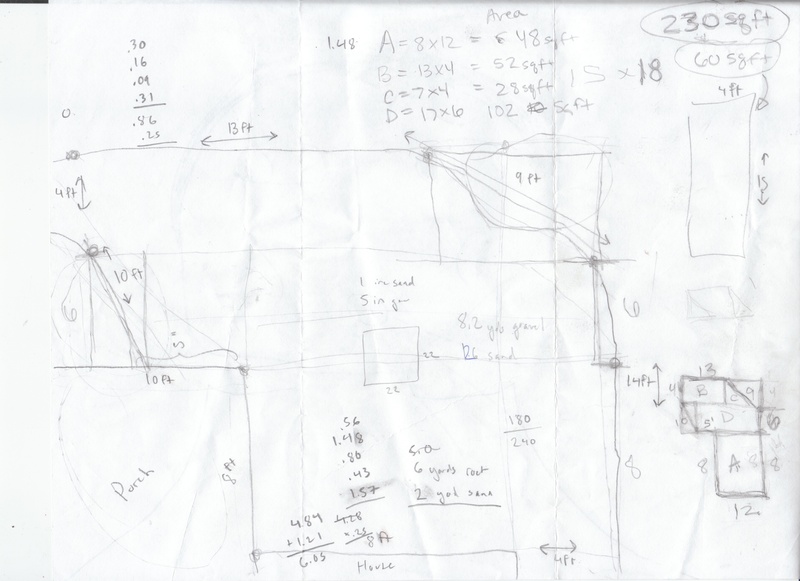 The plan I was following was based on a project plan in This Old House magazine, and adapted to our situation. 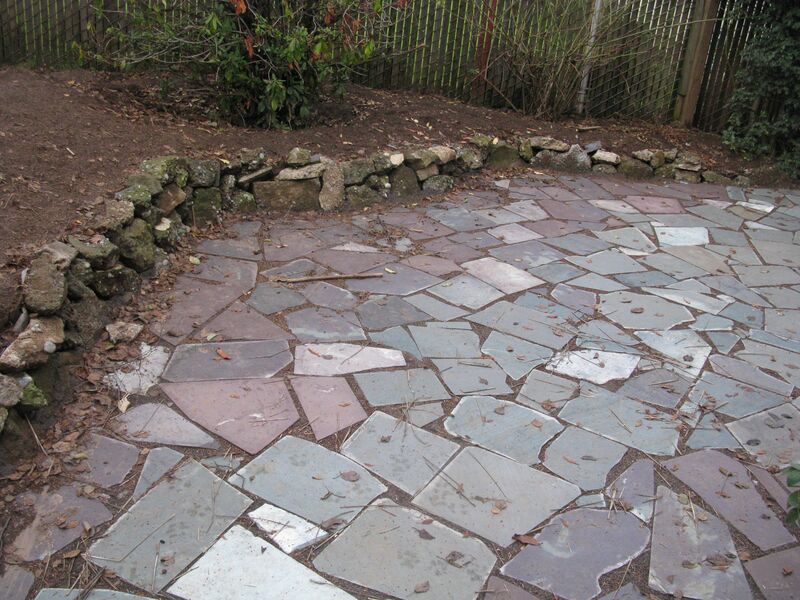 We had thin slate, not thick Bluestone and our soil had no loamy material, so I had to adjust. For our six inch depth of the patio base, five was supposed to be gravel with another one inch of sand. The slate was a negligible thickness. All our orders accounted for compaction of the gravel. 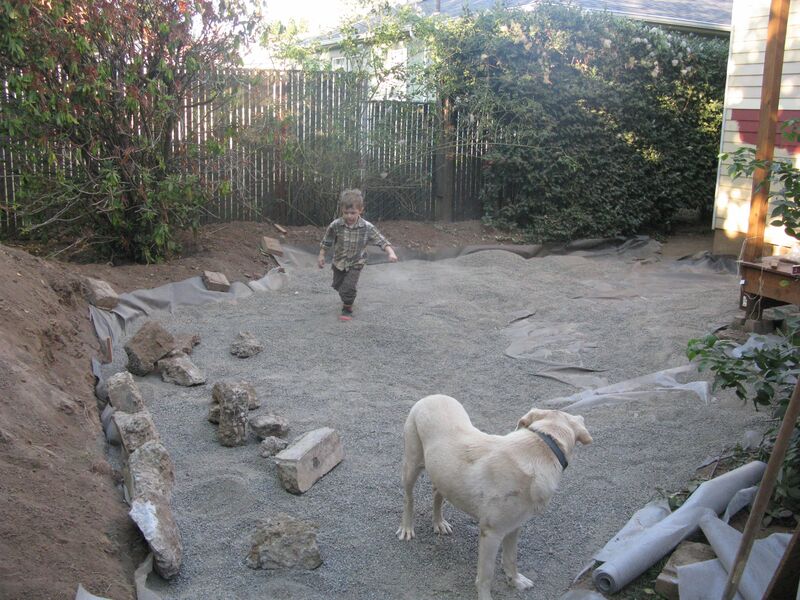 When the sand and gravel arrived, my in-house workers and I got to work laying it down. I quickly saw that we did not have enough for the planned fill, so in moving gravel around, we had enough for a four inch fill. We rented a plate compactor to help flatten it out, then as the summer long dry spell came to an end, we left it for a week to have the rain help settle it down. The slate patio is nice, although there is a fair amount of movement of the slate tiles as you walk over them, owing in part to the fact that the slate just isn’t that thick, and because of that can’t really sit “into” the sand base. Some stones have cracked. Also, the slate is all irregular, so gaps exist between pieces of the stone. Since our base is sand, these gaps are just sand which has a tendency to wash out or get dog paw prints in. We’re hoping that come Spring, some fast growing ground cover will help fill in the sandy joints and add some stability. It’s been a long time since my last post. Okay, a REEEEEEAAALYY long time. What’s transpired? It’s really difficult to describe this all in detail, so we’ll let the pictures do the talking for now. The master bath shower underway with the pan going in first. 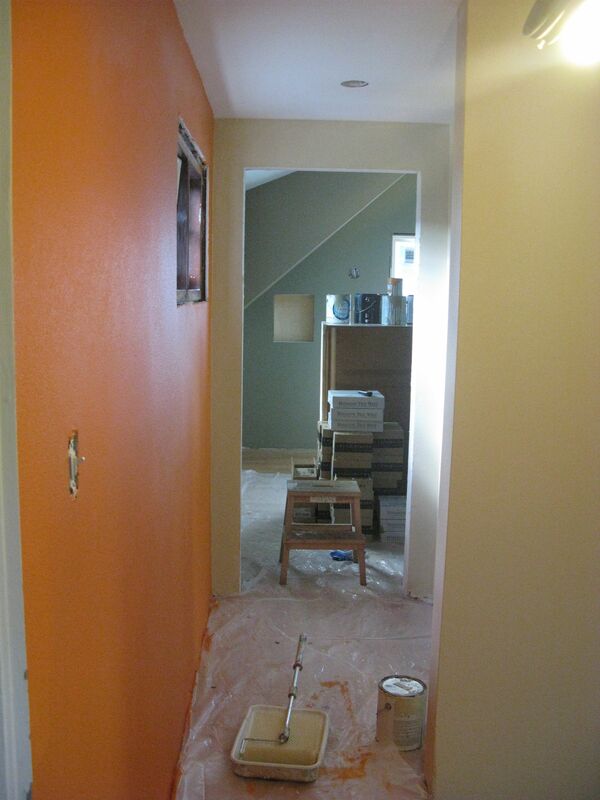 Prepping the little boys room with a really cool paint job. 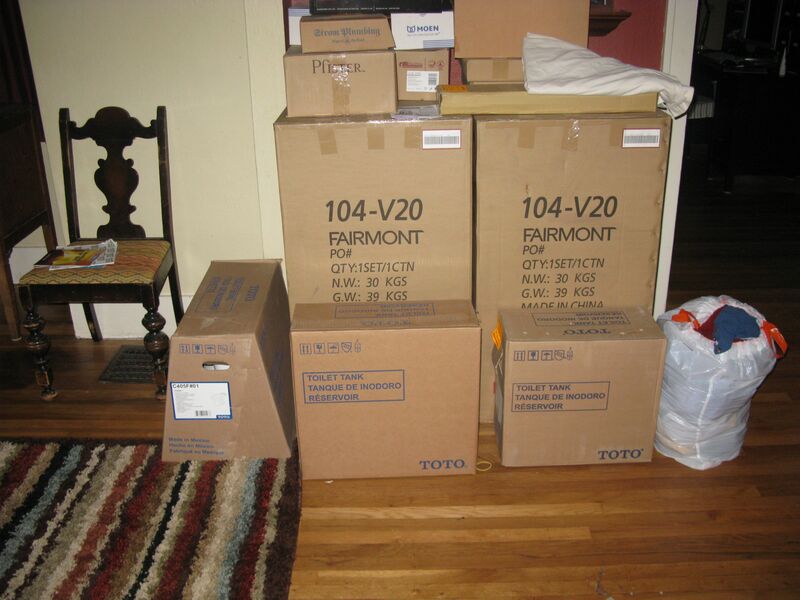 All our plumbing supplies awaiting install. 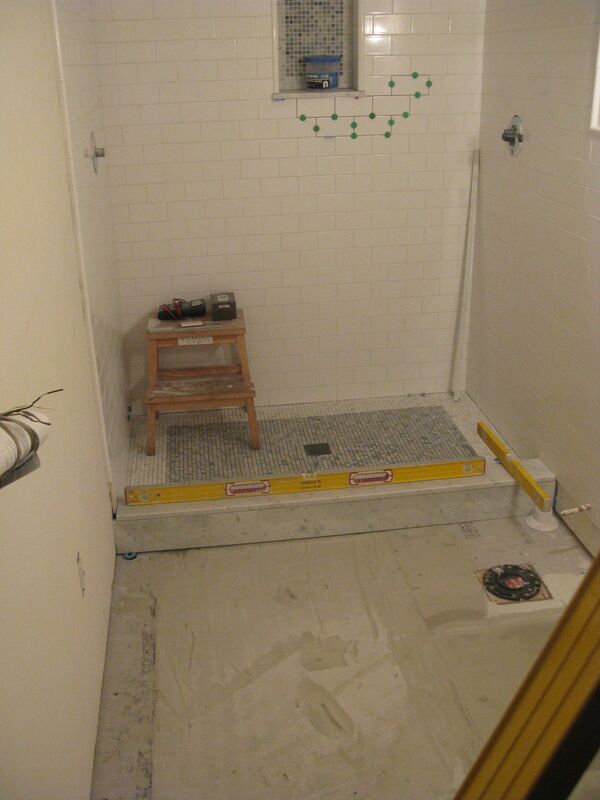 Master bath with most wall tile up and floor heat mat installed. 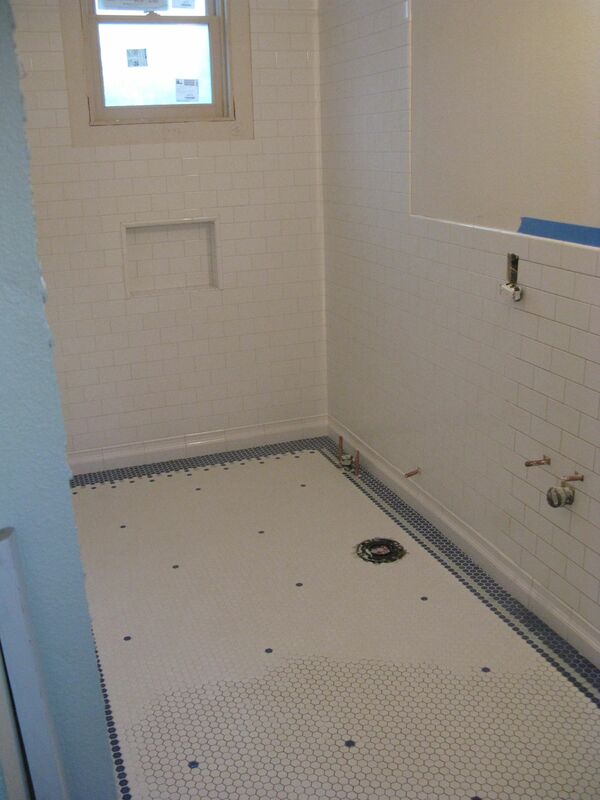 Awaiting stone and basket weave tile on floor. June 13, 2012 – We’re exhausted after burning the midnight oil in preparation of the arrival today of our sheet rock crew. We haven’t slept much, but by sitting here now and typing this, it’s proof we accomplished our mission of fixing, prepping, building and verifying all that needed to be done prior to the walls of our addition being sealed. What can four hands (and four paws, counting the dog) accomplish in ten hours? We were told they were to protect our wood floors, which as faithful readers will recall, were just sanded the previous week. It’s hard to tell how much damage the floors have sustained, since they first covered everything with brown Kraft paper, but I’ve cringed countless times as I’ve heard tools fall to the floor and sheet rock been dropped and imagined all the new “bruises” our new and new/old floors will sustain. 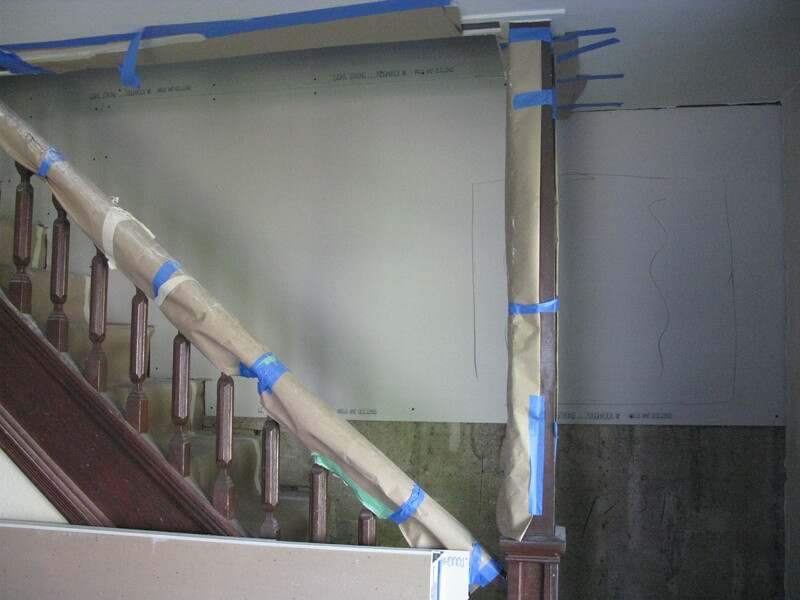 I’m particularly worried about the stair railings, as our tiny stairs are not conducive size-wise to allowing large ANYTHING going up – mattresses, furniture, plywood, let alone sheet rock. 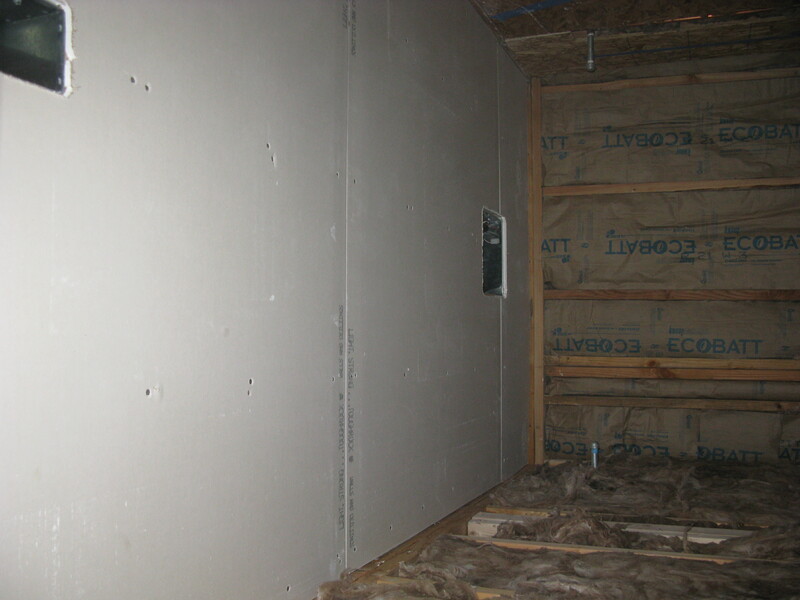 RC channel, or resilient channel was installed in the first floor ceiling. This is for controlling sound transfer. It was to only be in the bedroom portion, but it seems they installed it everywhere. Not bad, right? Yes, but it threw off the depth of our electrical boxes which we anticipated just .5″ of sheet rock for, ar enow submerged by an additional .5″ resulting from the RC channel. 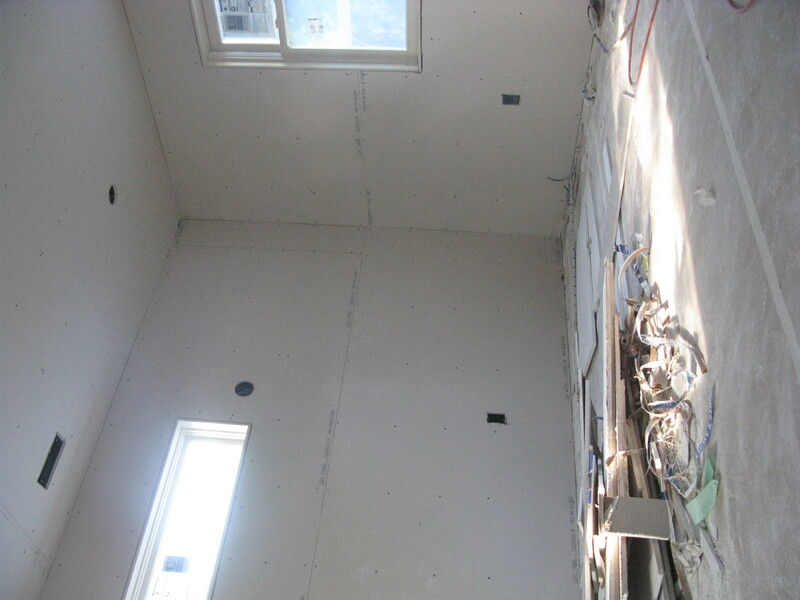 We asked for DensArmor in the bath areas, but on the ceiling in the first floor they seem to be installing regular sheet rock. Not sue if this is a problem, but it’s a concern. 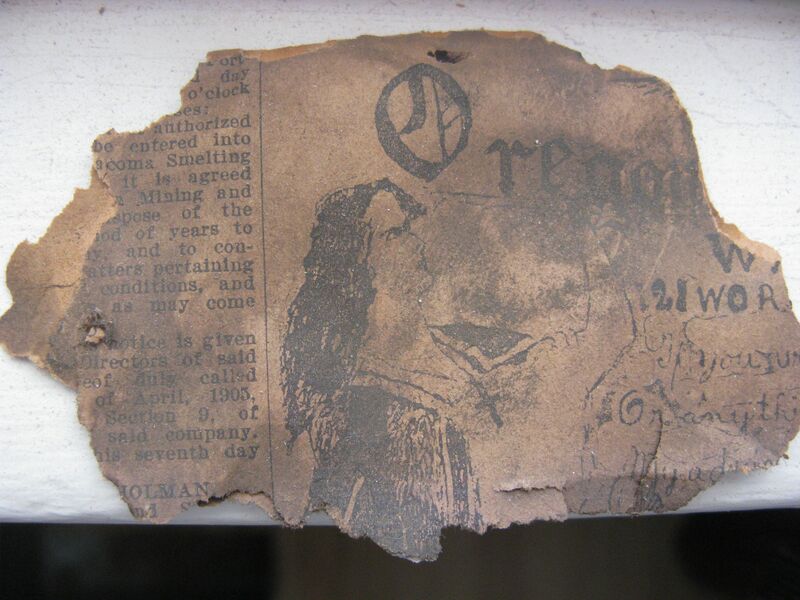 When you have an old house that you’re doing work on (I guess that goes without saying) people always seem to ask, “Have you found any hidden money in the walls?” Our answer has always been ‘no’ and still is – but we’ve found some cool treasures of history. 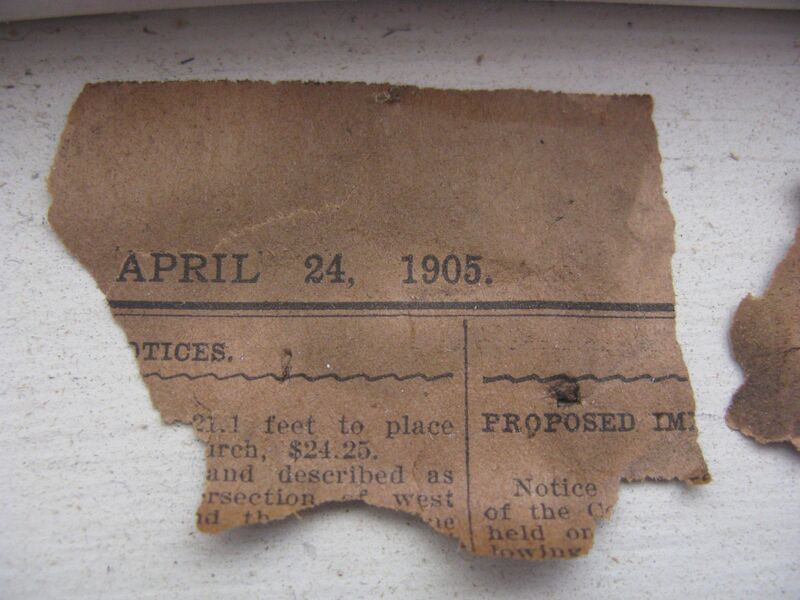 We know the city says our house was built in 1894, and though some deductive reasoning, we’ve found that the upstairs attic areas wasn’t made into bedrooms initially. 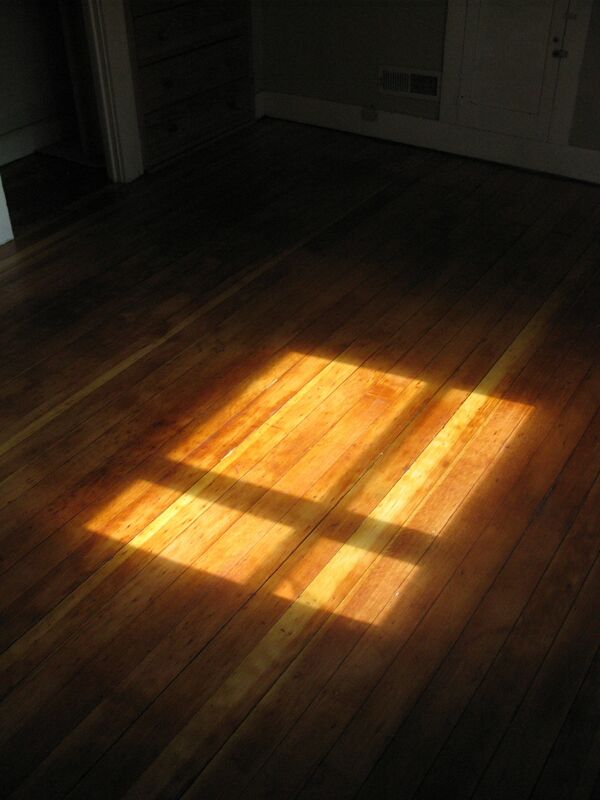 We also know that 3/4 of our house has fir floors which is typical of homes in the era, but that the main floor and the landing on the stairs had oak. Under the oak, however, is fir – so we know that at some point they floored over the fir with oak. 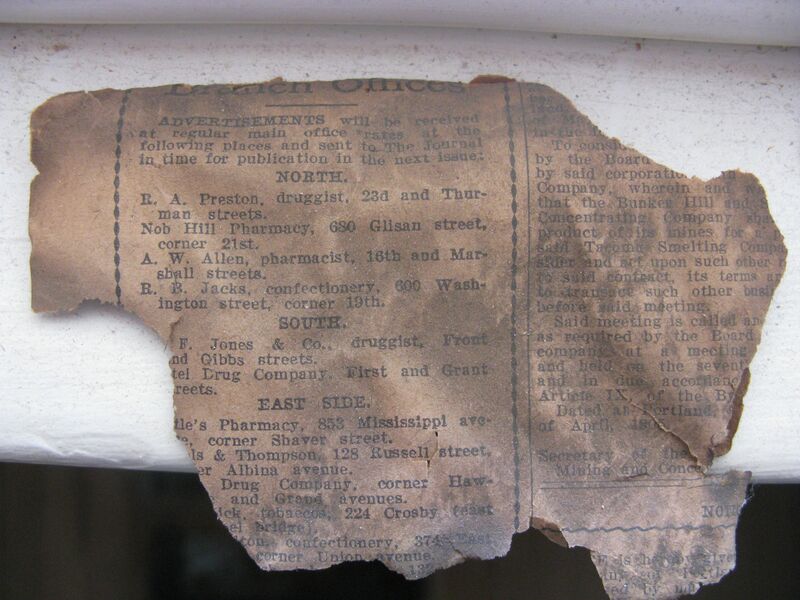 Our flooring guy found a newspaper clipping while removing some of the fir on the stairs which has given us a glimpse of the possible date. 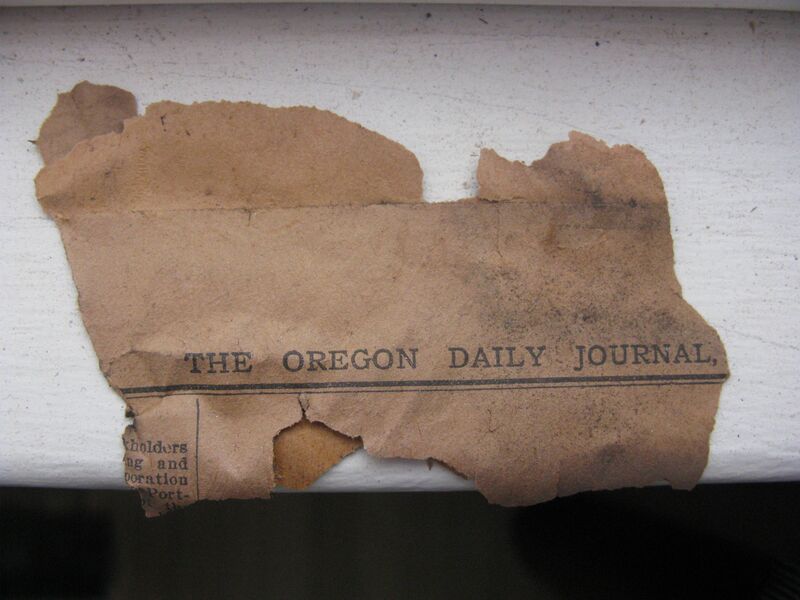 These are from the Oregon Journal, a now defunct Oregon newspaper. 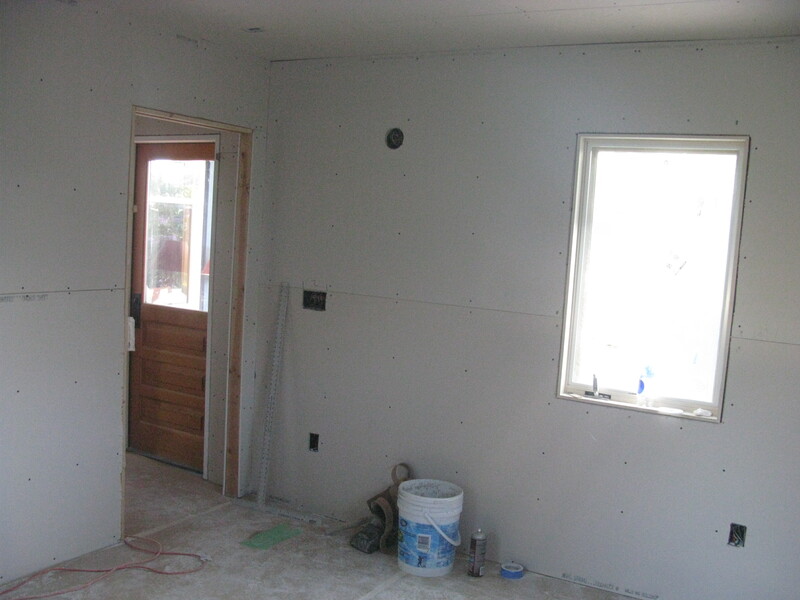 June 7, 2012 – Flooring has been underway for nearly five days now. And let’s just say that those five days have yielded some amazing looking floors! This is after much sanding, and only one coat of polyurethane. 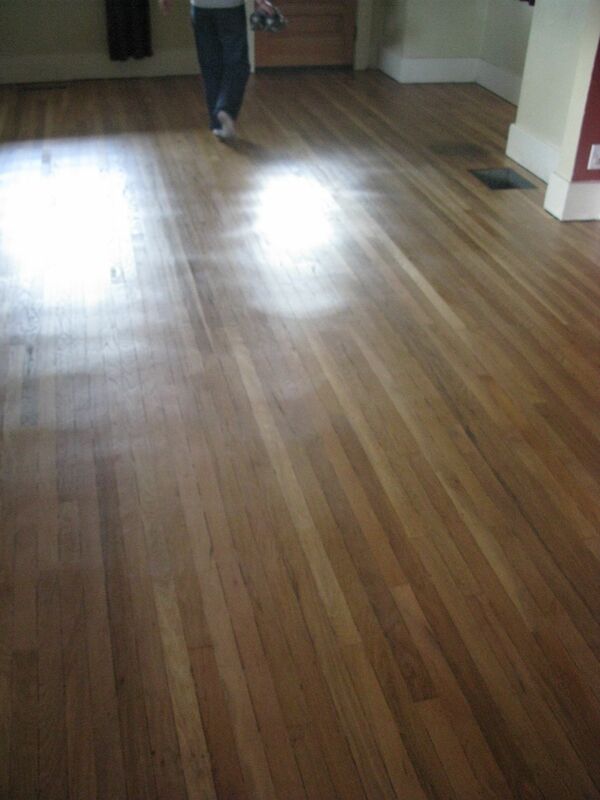 Our floor guy estimated the fir flooring to be well over 100 years old, and the oak to be about 80-90 years old. 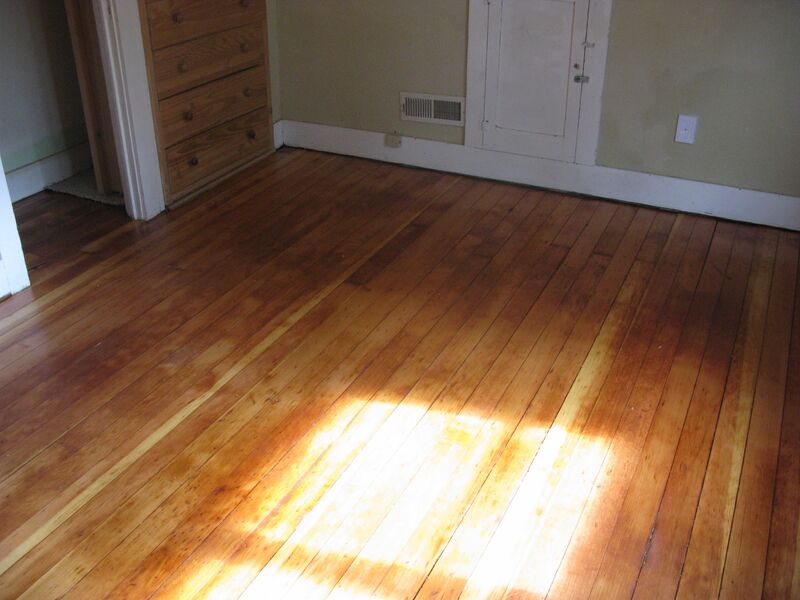 And they gave it lots of compliments too for being in such great shape in a 118 year old house! 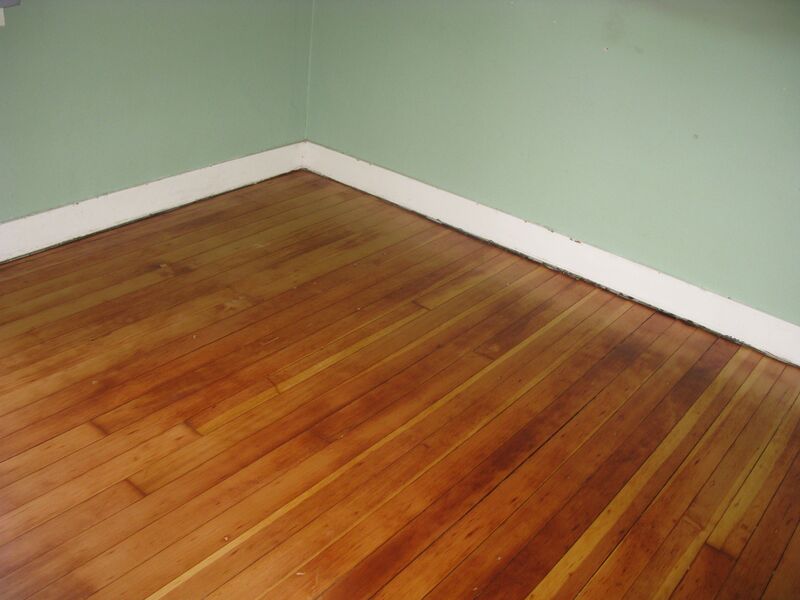 But prior to the floor beautification, it was the floor “uglification” – quite literally. 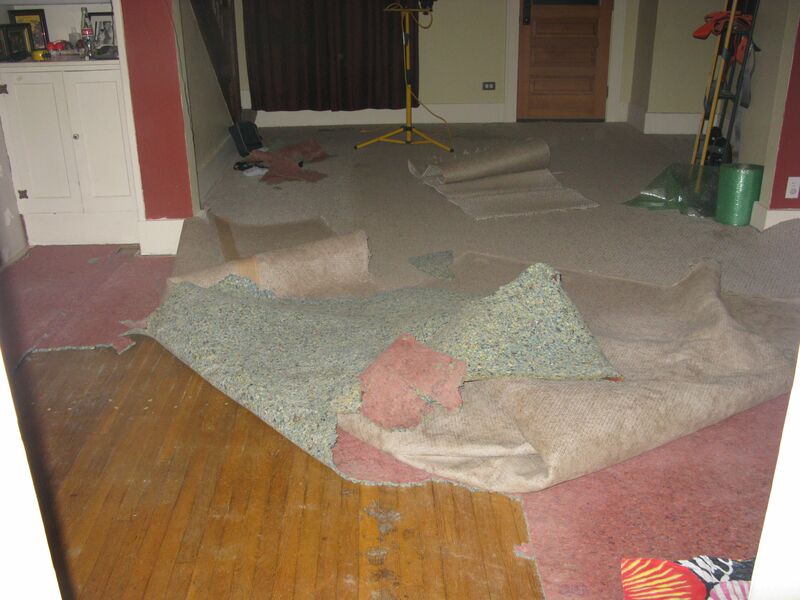 To have our floors redone, we needed to rip out all the carpet in our house. And to rip out all the carpet, we had to move out. Those are two very big endeavors! The picture doesn’t do it justice, but the floors were LITTERED with nails and staples we had to rip up by hand. Thousands and thousands of those little buggers! Flooring should finish up in the next few days, with some final work on the stairs next. 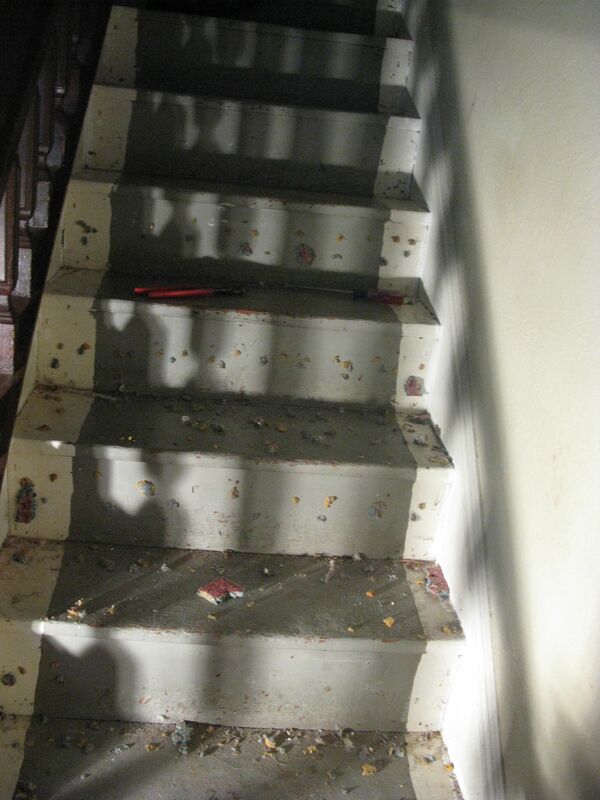 But first, we had to strip the stairs of nails – and paint! Using the stripper was not fun, but it went fast. 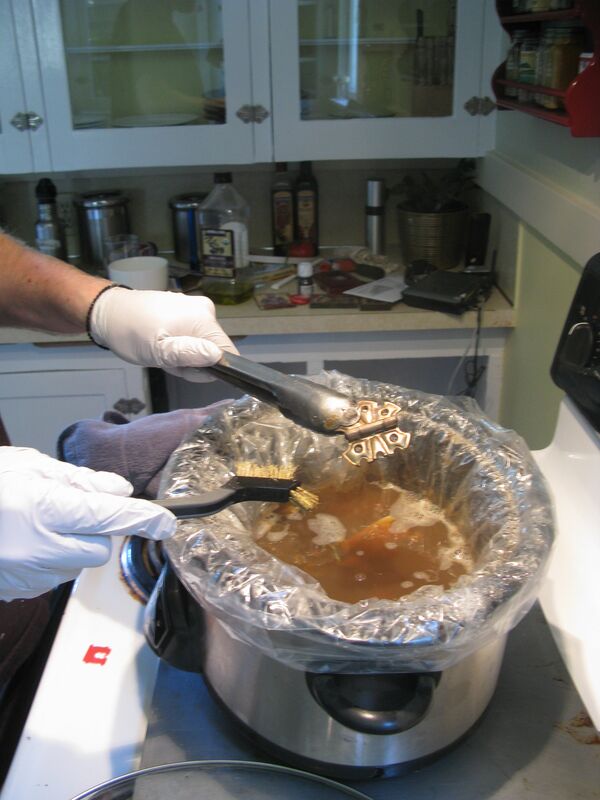 We used the chemical variety (which was toxic and nasty) but the experience was short lived. Stairs, minus carpet, being stripped of staples and nails by us. Next step was the stripping of the paint. Underneath, we are told there are some wonderful fir boards, which we’ll get to see in a few days.